Join us for our annual Holiday Open House…and experience the festive side of Calgo Gardens! 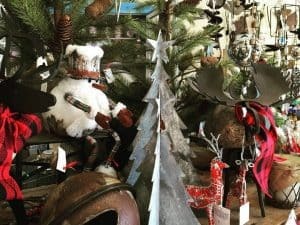 The Barn, our naturally gifted shop, is brimming with unique gifts you will not see anywhere else. The majority of our carefully curated offerings are handmade by artist/craftspeople, many with re-purposed and recycled materials. From US-made to Fair Trade our selection of pottery, glass, chimes, blankets, jewelry, baskets, soaps, decor and decorations are meant to bring artistry and harmony to your life, home, and self. Everywhere you look you’ll smile! And YES! we will be playing Holiday Discount Roulette.